Please feel free to add/edit this page as you come across cool things in Eagle! Eagle is installed on all of the computers in the GM lab. If you want a personal copy, the freeware version is available for download here. 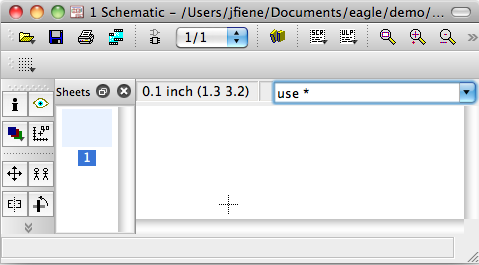 You'll also find lots of user-defined libraries that may contain parts that you're looking for. Performing this same search without the asterisks returns zero results, which is very frustrating! And DO NOT CLICK THE DROP BUTTON! If you do, it will temporarily disable certain library elements. To get them back, run the "use *" script described in the "Accessing Libraries" section above. 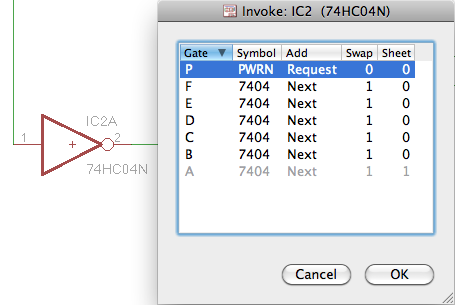 To add a second gate from the same package, once again use the Invoke tool, but this time select one of the other gates (shown as B-F in the image above). Power and ground can be found in the 'supply1' library - the standard are VCC and GND. To move more than one thing at a time, use the group tool to select around them, double click to finish selecting, then right click on one of the members of the group, and select "move: group"
ALWAYS double check the dimensions and pinouts of components against your actual parts! To add a ground field or plane, select the polygon tool, set the isolate value, then draw a shape (make sure it closes - this is often easier with coarse grid spacing), which will show up as a dashed line. Now, click the name button, double click on one of the dashed lines, and change the name to match your ground net (GND, most likely). Now, click the ratsnets button to have it generate the filled region. 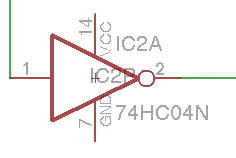 To put soldermask over vias, select Tools > DRC, then on the mask tab, set the limit to larger than your drill (or perhaps it's pad OD?) size, and it will mask over them - this is mostly useful for keeping your silkscreen clean.